People visit an Apple store in Istanbul, Turkey, Aug. 15, 2018. Anti-American sentiment has arisen in Turkey, with the Turkish president blaming Washington for the collapse of Turkey's currency. On Istanbul's main retail shopping street a man declares, "We will bring the Americans to their knees," as he burns dollar bills in front of TV cameras. An outpouring of anti-American anger is being felt across the country. "Let everyone see this, let everyone love their homeland and nation. No one should burn us with dollars. We burn the dollar; we will boycott American products," a man says as he burns the U.S. currency in Turkey's southern city of Adana. In a social media video, a man wielding a sledgehammer destroys what appear to be iPhones. The Anti-American gesture is somewhat diminished when the sound of another iPhone rings from one of his supporters. President Recep Tayyip Erdogan has called for a boycott of iPhones along with other American technology as he whips up anti-U.S. sentiment in increasingly bellicose nationalist speeches. 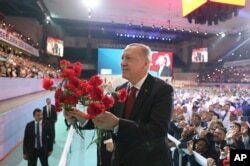 Turkey's President Recep Tayyip Erdogan throws flowers to his supporters as he arrives to deliver a speech at his ruling Justice and Development Party (AKP) congress in Ankara, Aug. 18, 2018. Erdogan's anger is in response to the collapse of the Turkish currency, which has fallen nearly 40 percent this year, much of the decline occurring in August. "An attack on our economy is no different from a direct strike against our flag and call to prayer," Erdogan said Monday." The aim is no different. It is to bring Turkey and the Turkish people to their knees." U.S. President Donald Trump is blamed for the August currency slide after imposing sanctions and tariffs on Turkey over the ongoing detention of American pastor Andrew Brunson. Erdogan accuses Washington of waging an economic war against its NATO ally. People change money at a currency exchange office in Istanbul, Turkey, Aug. 17, 2018. U.S. National Security Advisor John Bolton insisted Wednesday Ankara could end the crisis. "Look, the Turkish government made a big mistake in not releasing Pastor Brunson," Bolton told Reuters news service. "Every day that goes by that mistake continues, this crisis could be over instantly if they did the right thing as a NATO ally, part of the West, and release Pastor Brunson without condition." Brunson has been jailed for more than a year on charges of allegedly helping a network led by U.S.-based Muslim preacher Fethullah Gulen, who Turkey blames for a failed 2016 coup attempt. "His statement is proof that the Trump administration is targeting a NATO ally as part of an economic war," Turkish presidential spokesman Ibrahim Kalin wrote in a statement in reply to Bolton's comment. "There are so many serious problems at the same time that this is one of the worst moments in recent history when it comes to U.S.-Turkish relations," said former Turkish diplomat Aydin Selcen. "The anti-Americanism in the last decade has hit a record high among all the social classes, and from all the political parties from left to right," Selcen added. For decades, anti-Americanism has been rife in Turkish popular culture. Films and TV shows often show Americans conspiring against Turkey. However, analysts suggest a more fundamental problem underscores existing tensions, a failure of Turkish-U.S. relations to adapt to the post-cold war era. During the cold war, U.S. military power provided a shield against the Soviet Union. U.S. President Harry Truman's deployment of the battleship Missouri to Istanbul in 1946 at a time of high tension between Ankara and Moscow is widely seen as the symbolic beginning of a strategic partnership. "There is a structural problem in Turkish-American relations that dates back all the way to the end of the cold war, "International relations expert Soli Ozel of Istanbul's Kadir Has University said. "That is the interests have diverged, and the two countries have never really been able to figure out what the common base upon which they would build their relations again would be. And those issues have never been resolved quite frankly," Ozel added. The 2016 failed coup in Turkey in which more than 250 people died continues to foul bilateral ties. Ankara still suspects American involvement. Because of Turkey's strategic importance, Washington has long been suspected of having a hand in all three of Turkey's military coups. "Anti-Americanism existed within the elites themselves. They never trusted the Americans," Ozel said. "The [Turkish] foreign minister Mr. [Ihsan Sabri] Caglayan Gil said after one of our periodic coups that the CIA was responsible for the coup of 12th March '71. So in a way the United States and its maleficence, if you will, has always been accepted as the environment by Turkish politicians." "However, now the cold war is not there," Ozel added, "and Turkey has got a taste of acting as an autonomous actor. It has no patience for American meddling and America blocking what it wants to do." As is the way with Turkish diplomacy, tensions with Washington invariably mean Ankara is looking to Europe. Past difficulties with the European Union appear on hold, and shared anger directed at U.S. President Donald Trump is providing a useful common ground. However, analysts warn, given Turkey's myriad of differences with Europe, Ankara may have to pay a high diplomatic price for any reduction in diplomatic tensions.